Seeing as I had a few extra holiday days left over from my maternity leave earlier this year, we decided we’d get away for another short break. 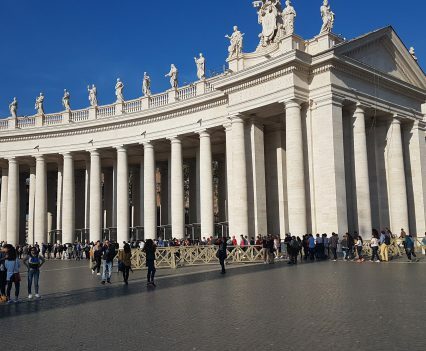 We set our sights on Rome, this would be my 5th time to the Roman Capital. 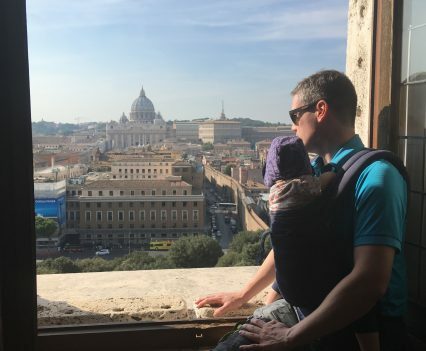 There are few places in the world that I would visit twice, let alone 5 times, but I really wanted Mick and Elara (I know, she won’t remember…) to see and experience the grander and history of the Eternal City. However, I had no idea how this was going to work with a very active 1 year old, who’s just starting to take a few steps. We decided to leave the buggy at home and instead packed our two carriers (the Ergo and Phil&Teds Metro). Mick planned to do most of the carrying. 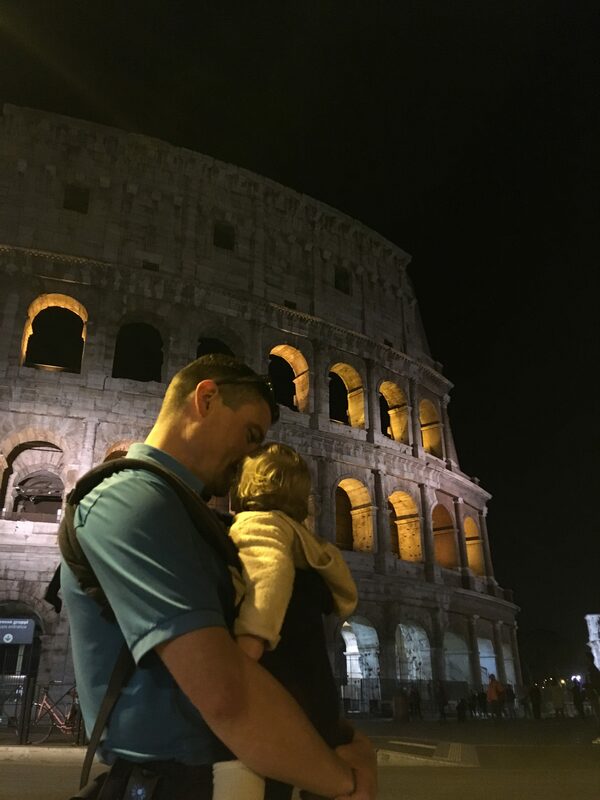 Up early at 4:30am to catch our 6:50 flight to Rome. We arrived early in the afternoon, took the hour shuttle bus to our Airbnb where we had a quick nap before we hit the town. 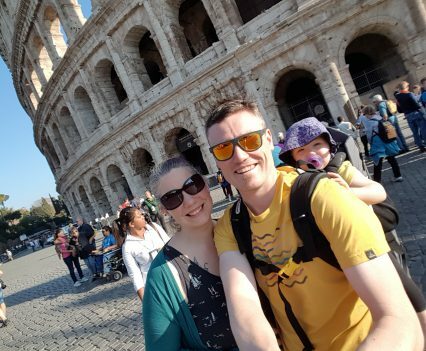 We hoped on the metro and took the line to Colosseo, without a doubt my first stop every time I’ve visited Rome. There is nothing quite like the feeling of exiting the metro and being slapped in the face by one of the most amazing sights in the world. 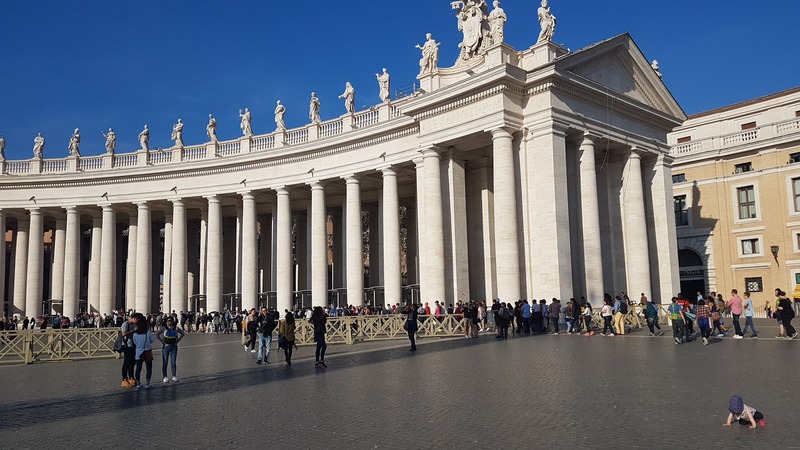 At about 3pm there was no queue to pick up our reserved tickets for the Colosseum and Roman Forum. The queues to get in were quite short as well. We visited for an hour or so, once again blown away by the history and magnitude of the place. 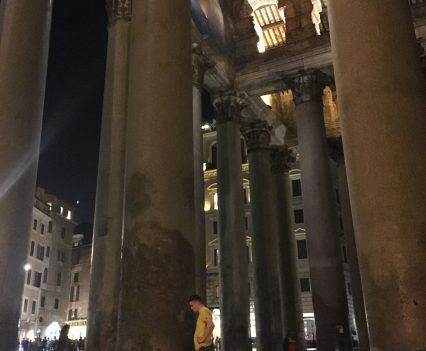 We then headed off for a walk around the city, grabbed a quick bite for dinner and ended up at the Pantheon well after dark. Elara had been cooped up for most of the day, so here, we let her move around the place. 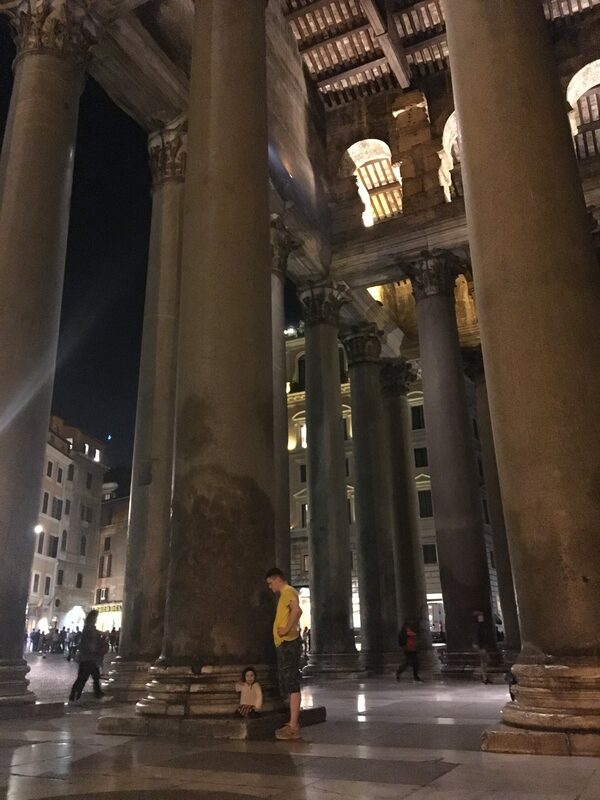 It was amazing to see such a tiny girl crawling between the 60 tonne Corinthian columns. A sight I won’t soon forget. After a pretty good night’s sleep (you just never know with a 1 year old!) 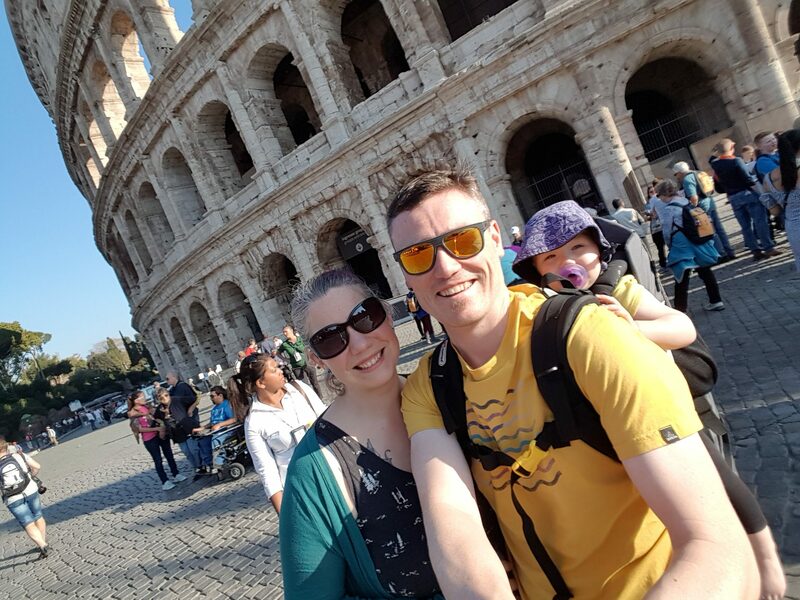 we set out to tour the Roman Forum, the most anticipated part of our trip and we were not disappointed. We used Rick Steve’s Free Audio guide and found it great, just the right amount of time, history and humour. 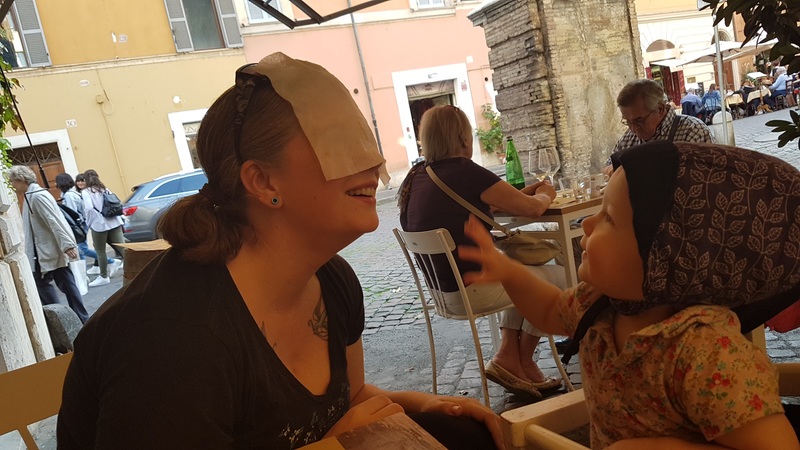 All that walking had brought on a hunger, so we found a small restaurant just around the corner from the Colosseum where I had a lovely calzone, tasting platter for Elara and Mick a Pizza. Then we headed back towards the Pantheon to see the inside of this ancient building. 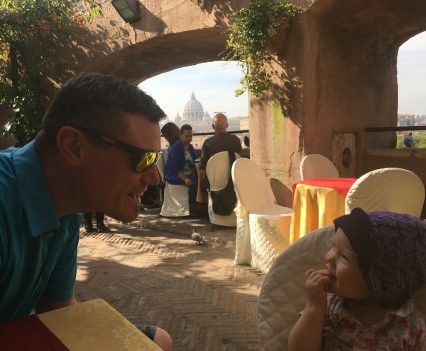 But, not without gelato first… It was quite a different scene during the day, there were queues of people throughout the columns where Elara was crawling the night before. That evening we went to dinner in our local neighbourhood at a restaurant suggested by our Airbnb Host. The service was good and the food was great. 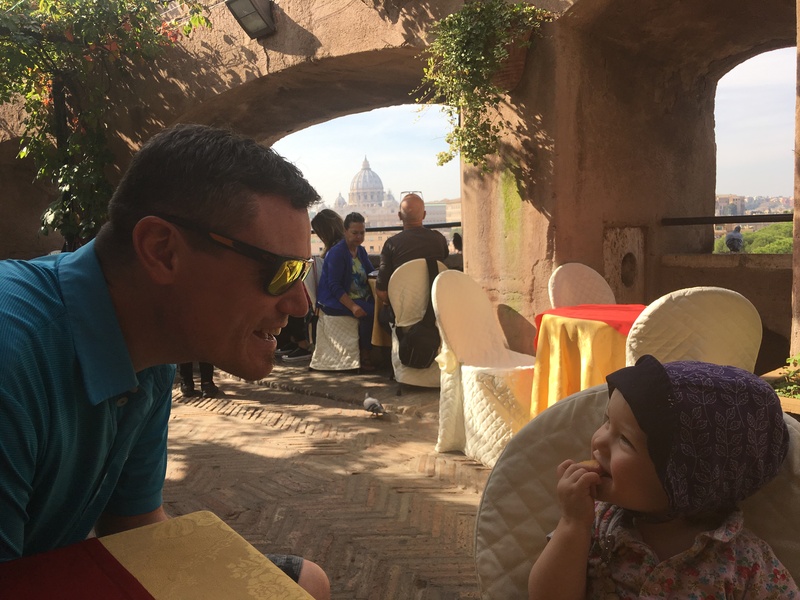 On our final day we visited the the Spanish Steps – bringing back memories for me from New Years Eve 2004, Castel Sant’Angelo (which I had never been to), the Vatican and finished our site seeing craning our necks inside St. Peter’s Basilica. For dinner that evening we headed into the old Jewish Quarter to check out a recommended restaurant. Unfortunately we arrived at 7 and they didn’t open until 8, with Elara that would just be too late. So we found a place nearby and tucked into the jewish/italian cuisine including the local specialty of boiled artichokes. To close the evening, we stopped at Gelateria Fassi got 3 scoops of the tastiest gelato I’ve ever had in Rome, and perhaps, even in all of Italy. 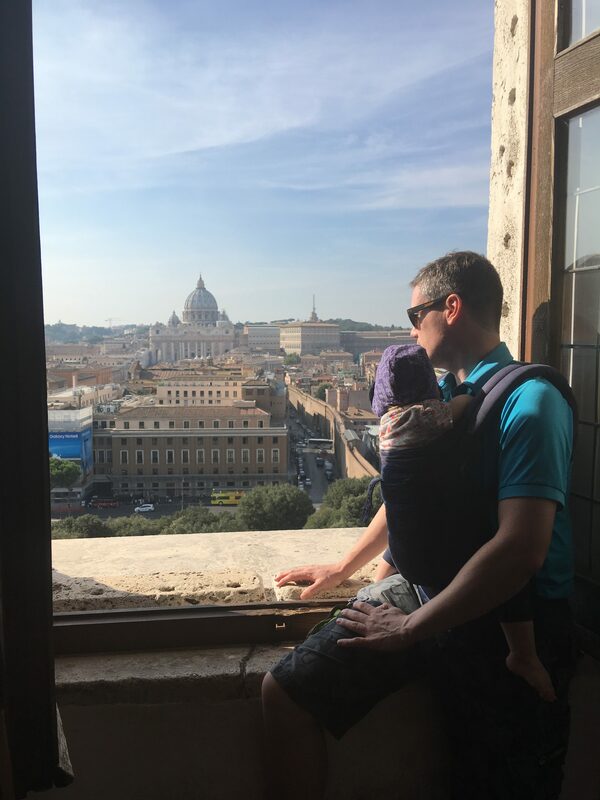 Thoughts on traveling with a 1 year old. We had an early flight. Elara did great, but next time we’d definitely pay the extra to sit in seats next to each other. We were able to, but only because of the kind people willing to switch seats with us, we got very lucky. 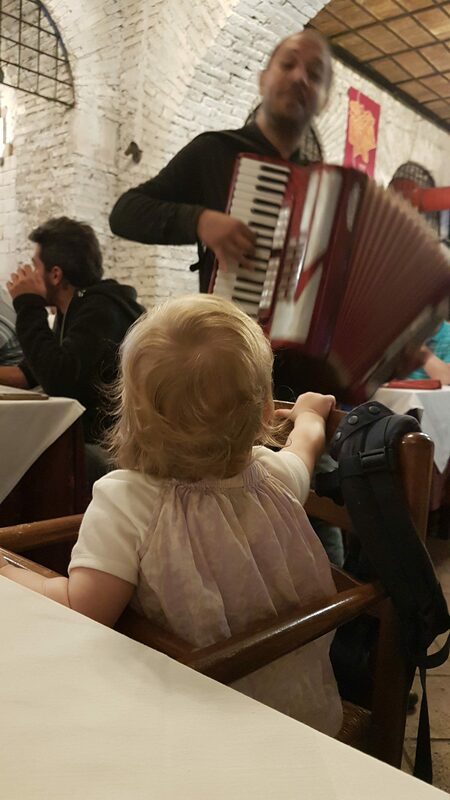 Most places had high chairs. We also discovered, late in the trip that the Ergo can easily strap around a chair and work as a harness. This was great for the quick snacks and drinks. 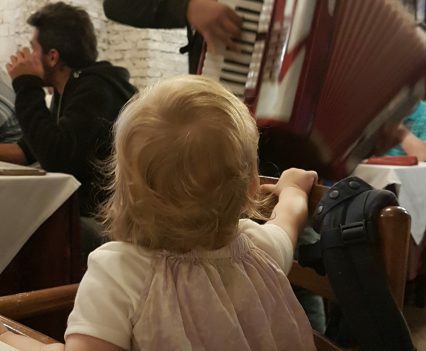 For dinner most of the time, the waiters would bring Elara a cookie/biscuit to munch on straight away. One placed asked us if we’d like to order something for the baby first before we even had a chance to look at the menu, this was great as dinner was quite late and we knew she’d eat fish if we ordered it. We ate nearly every meal outside which helped us overlook the mess that she made, we knew the birds or cats would clean up after her. 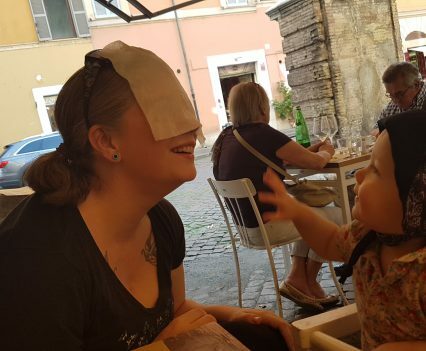 Elara had been regularly taking 1 longer nap at home, but during this trip she consistently took two 30min naps while on the go. She’d fuss for a bit but would eventually sleep, we found the ergo best for naps as we could pull the hood up over her. We were happy we brought two carriers, as Mick’s shoulders were sore after carrying her for 7+ hours on day one, so it was nice to have the other carrier so pressure was not on the same place for day two. 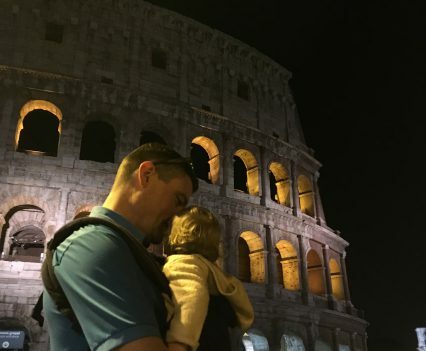 If we go back again (or to another large walkable city) we’ll probably invest in a very light weight buggy as we only took the metro a handful of times and could have easily carried her up and down stairs. We also saw others with large prams actually using the escalators in the metro. During a non-busy time this seemed to work fine, but I wouldn’t have chanced it myself during rush hour. Speaking of rush hour, it was very difficult to get on the metros even with Elara in a front ergo carrier (it would have been even harder with the Phil&teds and probably impossible with a buggy. So for next time, we’ll bring the Ergo and lightweight buggy.